I have been following the recent H1N1 swine flu outbreak with interest because I work at a company that makes flu vaccines. It's been covered in a few art communities because of creative things people have done in response to international news. This got me thinking about the relationship between people and news, and how people, as a whole, respond to current events. Searching keywords on twitter (as depicted in xkcd, above) is a great way to visualize how reactions to current events unfold in real-time. I have seen, both on- and off-line, that much of the response to this influenza outbreak is dependent on what people know about the virus, but understanding does not always yield the same outcome. Since I have done a lot of research with the virus, I have a much better understanding of the current epidemic than a lot of people, and sometimes forget that most people still don't understand the nature of the disease. I've seen comments along the lines of "I don't eat pork, so I won't catch the flu," and today a co-worker told me how surprised she was when her brother commented on how he'll never catch the swine flu because he "doesn't sleep with pigs." That's not how the flu works! Are you informed? Influenza, like a number of respiratory viruses, depend on host-to-host interactions to spread. That is, it relies on people to pass it on to other people. There are different influenza viruses that infect different animals (birds, pigs, horses, dogs, ferrets), but for the most part a given variant will only infect one species of animal. Each year, the human flu strains mutate to bypass our immune system's resistance to last year's strain, and sometimes we get a virus that is transmissible between humans and pigs (or sometimes birds). In this recent case from Mexico, the virus contains pig-specific proteins, which are unlike anything we (as a population) have been infected with before, so we are poorly-protected against the new strain. So even if you had the flu shot this year, you won't be protected against the current H1N1 swine flu. 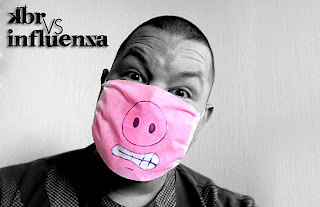 Now that you have a rough idea why the swine flu is dangerous, it's important to remember that the best way to contain influenza is to avoid crowds and people-to-people contact. What scares me about diseases like this is how quickly it spreads and kills. A few months ago, I stumbled upon this website and read their entire collection of personal accounts of the 1918 and 1957 pandemics. 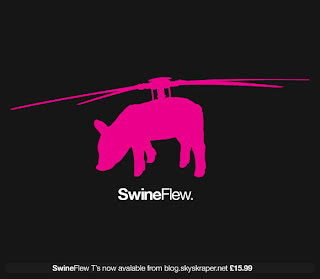 After hearing about the new swine flu last week, the first thing that came to mind was how many of the stories there mentioned how a person would come down with the bug one afternoon and was dead by morning. Will this strain be as devastating as the 1918 Spanish flu? From the data we have so far, it doesn't seem as virulent. Although the epidemic is currently not yet fully contained, the government is doing its part impede its spread, and cyberspace continues to provide information... or sometimes misinformation. Here's an interesting video on how tragedies and natural disasters are used to manipulate the public into obedience. Their remedy? Stay informed! If you'd like to ask me a question about the flu virus, I'll do my best to answer in the comments section. Thanks for reading! 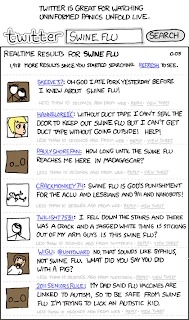 This adds nothing to the serious side of this discussion, but a cartoon did feature "Swine Flu" as part of its plot. That cartoon was totally random. XD I did notice that the clip was uploaded last year (and the person noted it was an "old cartoon"), which means that the cartoon was made before this year's outbreak. Related: Here are a couple more interesting links I found more recently. "When they run out of conventional masks"A recent Sinfest cartoon. That cartoon was actually made part of the "Kids Next Door" TV show. I think the KND series ran from maybe '02 to '08? Those links are great! That winnie the pooh picture is really funny.